Moving furniture into new positions is a quick, no-cost way to overhaul a tired living room. Small changes can often yield the biggest results. 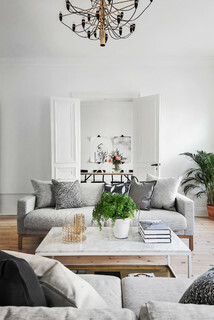 Try moving the sofas into a new position or placing your coffee table at a different angle; swap a second sofa for a pair of armchairs you might have in another room; or replace a large coffee table with a cosy ottoman or a trio of funky side tables. Foliage and flowers will make a room feel fresh and energised, and can be used for so much more than just a table centrepiece. You might also consider window treatment styles that allow you to control the amount of light in a room, she says. 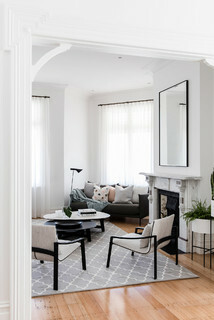 “Window treatment trends have shifted from block-out roller blinds and timber shutters to white plantation shutters and semi-sheer or sunscreen blinds that allow you to control exactly how much light enters a room,” says Wilson. Lighten up your interior without busting the budget by swapping textured, wintry cushions and throws on the bed and sofas for lighter ones in soft, natural materials, advises Amy Stead, director at Amazema Interiors. “Bright prints on cotton, linen or silk are ideal for spring and summer,” she says. New artwork can completely alter a room’s mood and doesn’t have to cost you the earth – you’ll find all manner of prints online and in-store to suit a variety of budgets. But if your budget doesn’t stretch to new pieces, consider swapping around the artwork you already own to give your home a fresh, new look. Moving pieces from one room to another or creating an entirely new wall layout can be surprisingly effective, says Wilson.